It’s difficult to miss this trio of girls with their striking outfits while we were out and about on the Harajuku street. Let’s take a closer look at their ensembles, shall we? At the left sporting standout pink hair is 15-year-old Mawoni. 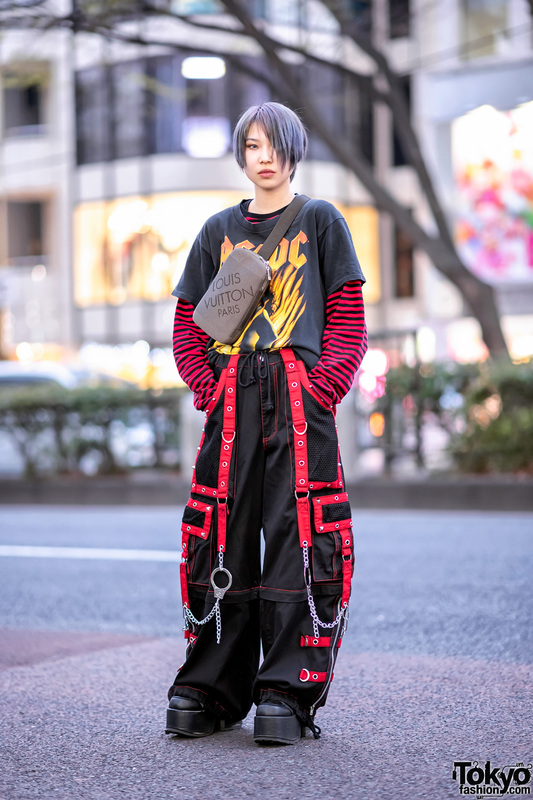 She is dressed in a black Kiss t-shirt with cuffed sleeves from DonDonDown, a mauve skirt from King Family, white ribbed socks, and black platform lace-up boots from Yosuke. 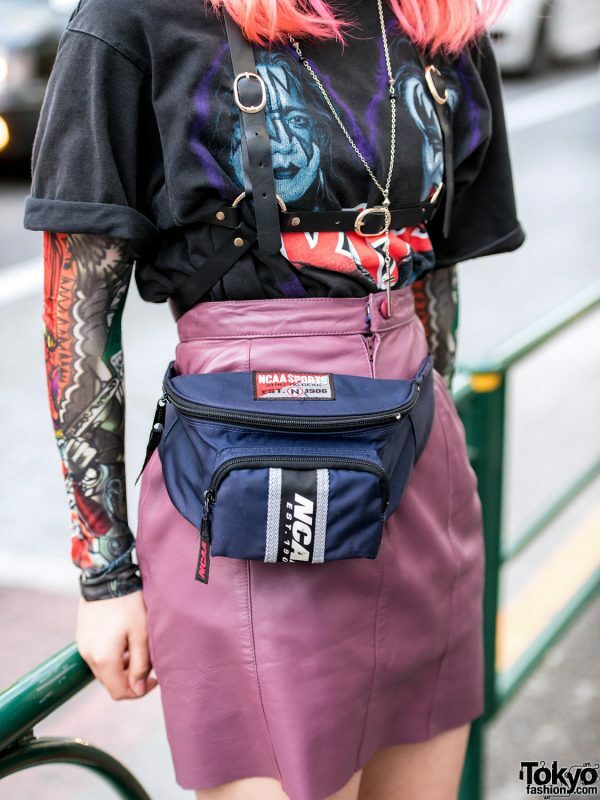 Strapped across her waist is a King Family NCAA Sports waist bag, and she wore tattoo arm sleeves and a black leather harness across her chest. Mawoni finished off her look with accessories – bought in Nakano – such as silver hoop earrings and a silver cross pendant necklace. 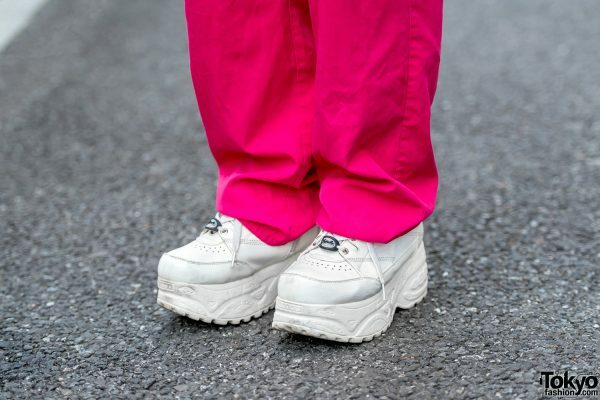 Mawoni’s favorite fashion brand is The Four-Eyed, and she likes the music of Seiko Oomori. For her social media updates, follow Mawoni on Instagram and Twitter. 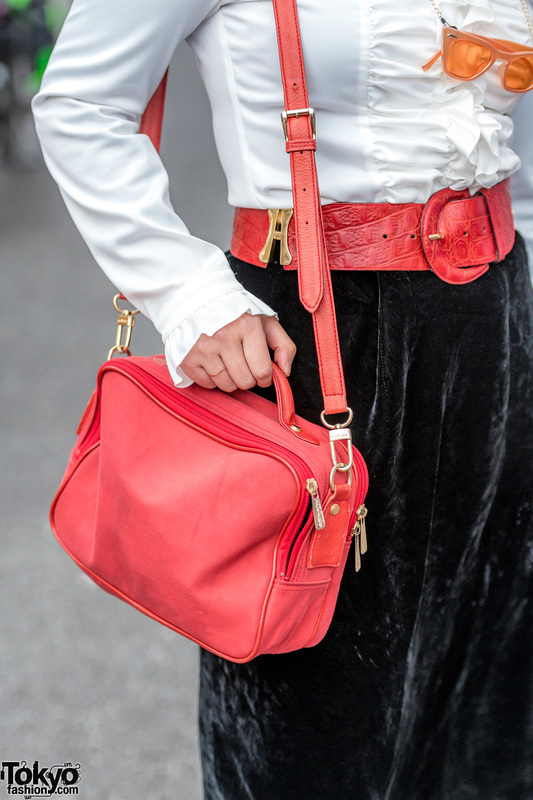 Rumpa – at the middle – is wearing a hand-me-down long sleeve white shirt with ruffled bodice and cuffs, which she tucked into a black velvet pencil skirt from Kinji and cinched with a red wide belt. Aqua tights, platform lace-up ankle boots from WEGO, and a red hand-me-down satchel bag completed her ensemble. 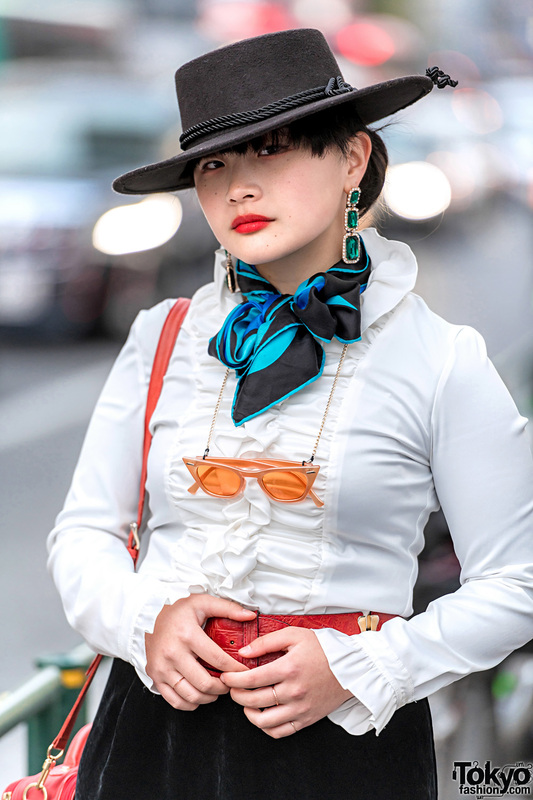 The 16-year-old student accessorized her look with items from Forever21 and Thank You Mart such as a black wide brim hat, gemstone drop earrings, a black-and-blue silk scarf tied around her neck, orange sunglasses with chain straps, and multiple gold rings. Rumpa loves to shop at Gucci, and she loves the music of Lady Gaga. Rumpa is active on Twitter and Instagram. Meanwhile, Miori – a 16-year-old student – is sporting an all pink ensemble which consists of a pink-and-white Ralph Lauren long sleeve striped shirt with a mock-neck collar and distressed hem with bows, pink pants from Panama Boy, and white platform sneakers from Yosuke. She finished off her look with accessories from Nakano such as a straw hat, pink hair ties for her twin tails, a pink Mickey Mouse whistle necklace, and a cute pink watch. 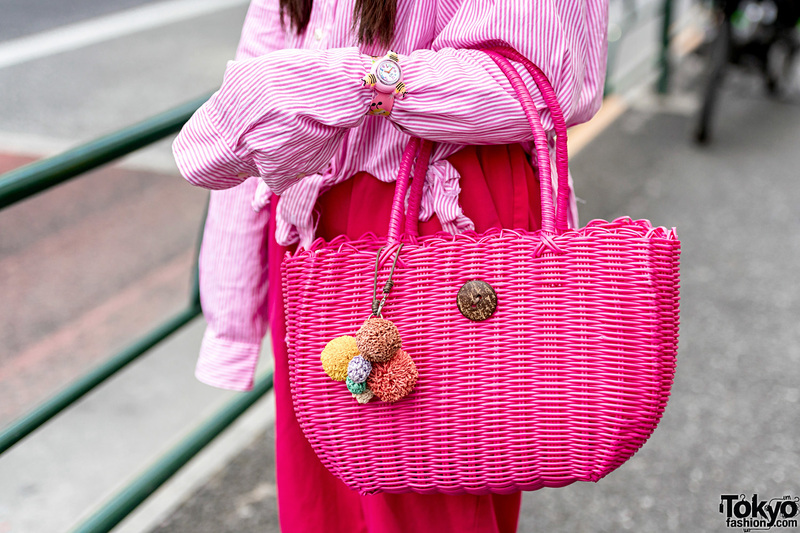 In addition, Miori is toting a pink straw tote bag, which is her mother’s. 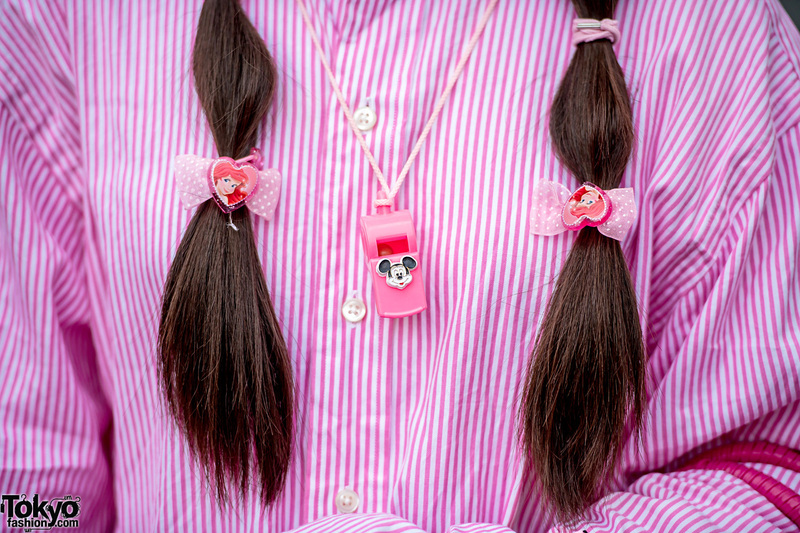 Miori loves to source chic items from Kinji, and she loves listening to Dempagumi.inc. Miori is also active on Twitter and Instagram.